When performing a transaction the EFT subsystem may return a bank response code giving more information. While the exact meaning of the code depends on which acquirer and EFT system you are using, the codes are broadly defined. Tip. If searching for a code that isn't shown below, search the internet for "eft response code NN". 52 Account error. The account the user selected, cheque, savings, credit, is not valid for this card. The Smartpay Keylink plus interface connects the POS via a serial cable, or USB to serial adapter. The interface is two-way, in that the POS reads the result from the Pinpad but staff do have the ability to manually override the transaction. When a payment is sent to the Smartpay terminal, the Point of Sale displays a status screen as shown below. The buttons on this screen are initially locked for several seconds and will unlock after a preset timer. This intial locking is to stop staff from answering before the pinpad could possibly have worked or failed. The screen will close automatically as soon as payment details are received. If this screen is not closing automatically, then the physical connection to the pinpad has been lost (cable fallen out, COM port changed) or pinpad is not in keylink plus mode. If you change any settings in fpos.ctl you need to restart the Point Of Sale for the change to be effective. If the COM port number is greater than 9, then you must use the following format to specify the port name. The example below is showing COM23. You can use this format for COM ports less than 9 too if you wish. It can be difficult to be certain you have the correct COM port if more than one port is present in the computer. Unless you have specific testing hardware you will need to try each COM port in turn. Fieldpine Point of sale sets all the COM port parameters and you do not need to worry about the COM port settings in Windows device manager. To be specific the POS automatically sets all KeylinkPlus solutions to 9600 baud, 8 bits, no parity, no hardware flow control, no XON/XOFF flowcontrol. Ensure the pinpad is in keylink mode. They are usually configured to this already if it was specified at purchase time. Run through all other checks first and then Smartpay for guidance on doing this. The amount has been highlighted above and will show your amount. If the log is showing payment requests but the amount is not being received by the pinpad, then the POS is writing to the COM port specified without errors. It is likely the problem is outside the POS application. If the log is not showing payment requests then the POS is not configured correctly or the com port to use is already in use. Try rebooting the PC and try again. If the Pinpad is receiving the payment, then after it is accepted or declined the POS is able to automatically read the status. Complete the transaction on the pinpad but do NOT press yes or no until after the pinpad has finished printing. The POS listens for the printing and does not get status information until after the EFT receipt has printed. If this is NOT working, then the most common cause is the wrong cable. Smartpay have different cables for Keylink (one way mode) and Keylink Plus (two way mode). Run the Windows program "Hypertrm" or equivalent. Try and connect using COMx. This program will give an error if the COM port is in use. Try both with POS running and not running. If the port is in use and POS is not running, then another program on this computer has the port allocated. Have you changed from one Eftpos vendor to another? Has the old vendor being fully removed from Windows? Payment express will open the com port when the POS is started if it was configured to use the same port. Cable disconnected. Generally the USB cable and the cable that goes to the pinpad are two or even three cables that join together. Ensure all these joins are secure and tight. If the cables do not have proper locking clips then consider taping the cable connectors together to avoid them coming loose. Do not assume that there will be no movement as cables and PCs will be moved or pulled during the expected installation life. Verify the COM port is not in use by some newly installed software which prevents the POS from opening the COM port. A symptom of this will be that the keylink.out trace file will no longer be writing payment request lines (see install problems above). With version P1914, you can issue quickcode "120" to review chat messages. The Keylink interfaces adds a chat message if it cannot open the COM port. 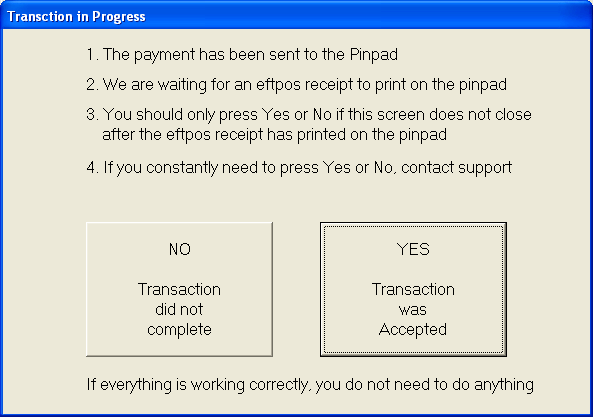 When operating, the POS user is given a screen to specify "Yes" or "No" to the payment progress. This screen should not be required if everything is working correctly. It is provided only so that should something go wrong that the POS does not lock forever. If the staff press yes or no wrongly (yes for no, or vice versa) then there is no option to change this. The staff have given an authoritive statement which cannot be altered without opening the potential for fraud. The Eftpos New Zealand interface connects pinpads directly to the computer, but Eftpos NZ also install a program into the PC to communicate to the POS and pinpad. The interface is two-way and fully integrated which means that there is no operator discretion at any stage. The minimum version of Eftpos NZ code that Fieldpine will support is V2.5.3.x (and OCX Version 7.9.5.9). Versions older than this should not be used. If you are running an older version the Point Of Sale will warn you on startup and advise you to contact ENZ for an update. You can still process and accept payments with older versions, but you cannot call Fieldpine support for any Eftpos payment related issues until you have upgraded to a supported version. This interface requires the interface dll "fpenzv5.dll". If you are using Version 7 or higher of ENZ code, you must be using fpenv5.dll version 1.0.3.19 or higher. If you are using Analyse Purchase functionality (eg Cardlink, etc), you must define the setting EftSendField48=1. This setting changed default from yes to no when version 7 of ENZ software was released, so you must now explicitly enable this functionality. 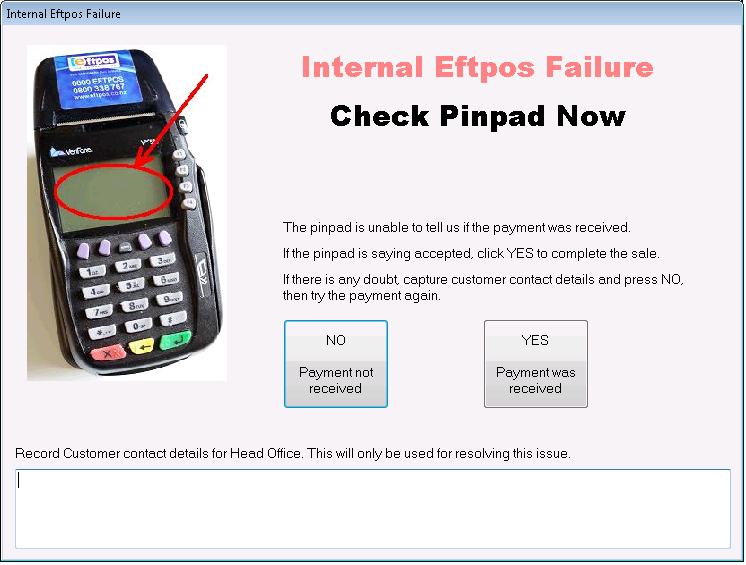 If the interface is not working or hanging, verify that the "Eftpos Client" is running. You should be able to see a green icon in the status bar if the client is functioning correctly. If the icon is red, click the icon to display the eftpos control panel and diagnose the problem. This client is part of the ENZ software so any questions should be directed to your eftpos service provider. Often an Eftpos problem will be reported on the receipts printed, as shown to the left. 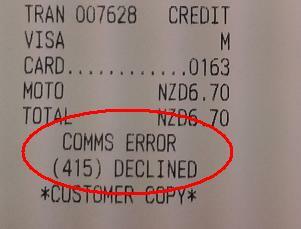 Problems seen on receipts like this should be directed to Eftpos NZ support as they are reporting problems from the Eftpos sub system. Comms Error The eftpos system failed to connect to the bank or acquirer. Verify your store has internet access, or phone lines are working. In some rare circumstances the Eftpos subsystem will return a payment failure to the POS after the transaction. Specifically this is when the computer has lost connection to the pinpad. When this happens, the POS has not received a useable response from the Pinpad and human assistance is required. The POS will stop and ask the user if the transaction worked or not, and their response is set as the actual payment status. If they say "yes" when payment was not actually received, the customer will not be charged. If they say "no" when the payment was received, the customer may be charged twice. We strongly urge you to capture the customer contact details in case repayment is required. The Eftpos NZ interface writes a log file of all interaction with the eftpos subsystem. The file is called EftTrace_YYYY_MMM.out If you believe you have a programming level issue, you can review this file to help isolate whether the program is POS side or Eftpos side. The blue section is written when a transaction is requested from the Pos. The ttype parameter indicates the type of transaction being requested.